Guadamur Castle is undoubtedly what distinguishes the town, which was built a ride from all others in the area. This opulent Moorish palace was erected east of the village, dominating the hill above the town of La Natividad. The Castle Guadamur offers a sympathetic view of the small Spanish town, which is located in the central province of Toledo Spanish region of Castilla-La Mancha. The town itself is quite close to Toledo. 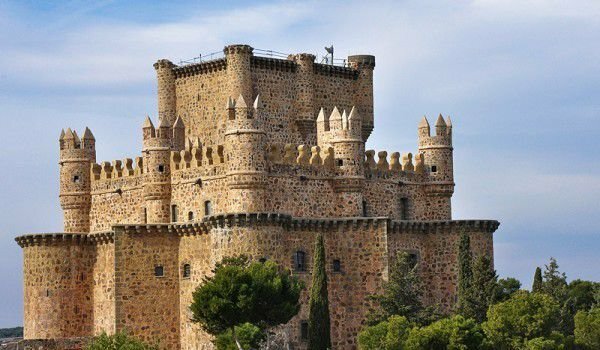 Guadamur Castle was built in the 15th century by Count Pedro Lopez de Ayala, who ruled in Fuensalida in 1470 and was Lord of Cedillo. The Count was something like a pet for the Castilian royal family. In Guadalamur Philip (Philip the Fair) and his wife - Princess Joanna, spend their honeymoon, and then Charles V returns to the palace to a deceased grieving wife Isabella. Guadamur Castle was destroyed by French invaders in 1809 and remains in the wreck it sank and then in 1887 it was restored by Count Asalto. The Earl was a descendant of an old Catalonian family. He and his family decided to restore Guadamur to its original appearance from the 15th century. Handsome Guadamur was robbed during the Spanish Civil War of 1936, but later returned to his brilliance. After restoration the Spanish fort was declared a historical monument in 1964. Guadamur was erected in a square, each corner stands one flat oval tower. The whole palace is surrounded by a moat and wall and a swing bridge. The low wall surrounding the main body of the castle was built in the square and complemented by numerous smaller round towers. Architecture of the castle looks as if the parts are built in different historical stages. Exterior walls are constructed in a manner which only allows expansion upwards. In the inner courtyard of the fortress there are 6 towers and the walls are covered with very interesting square windows with arches. The walls and towers of Guadamur in several places are engraved with coats of arms of the Lopez de Ayala family.